Basically, if it rains fairly heavily, I see water at the bottom of the alu-box. I do own the waterproof liners and use them, but is there a way to sort of "seal" the lids and box so I don't open it up and see a small puddle of water at the bottom of the box after the rain? I would do some off-the-bike testing to see where the water is getting in. Pour water over each corner, one corner at a time, lifting the lid and checking the interior after each one. 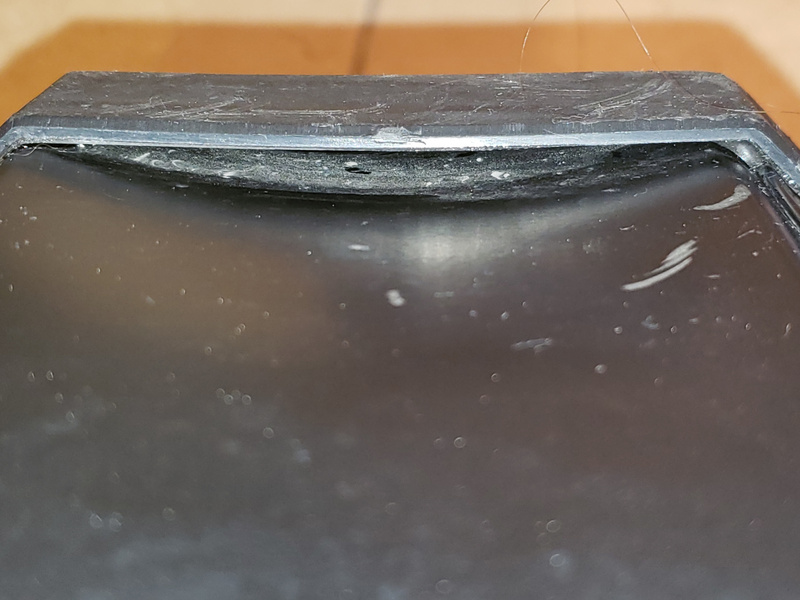 Rivets leaking? The case itself should have a high enough lip that fits inside the lid when it comes down onto the case, but spritz water into the gasket connection point between lid and case. Perhaps your locks are not pulling the lid down far/tight enough. Any thought to putting a pin hole or two into the bottom of the case so that if/when water gets in, it can also get out and not soak the contents in the case by creating a pond at the bottom of the case? It's probably easier to fill the pannier with water and see where it's leaking out of the box. It might not be the lid seal; water could be leaking in through an attachment point for a latch, or something like that. I'm not familiar with that particular type of pannier, but if the lid isn't sealing, perhaps you could make your own O-rings. McMaster Carr sells a kit that you can make any diameter o-ring you need. sfalexi and Null 13 like this. Years of backpacking / canoe camping thought me that it was better to seal things in waterproof pouches inside your pack rather than trying to seal the external pack while leaving everything inside loose / vulnerable. The individual pouches help stay organized too. For big stuff like a sleeping bag, Army Surplus places sell these rubberized OD Green back pack bags with tie strings in various sizes (I have #1 and #2 sizes). Even after tipping a canoe, the important stuff (sleeping bag, undies, etc) were still dry. Spec and SuperG like this. I have the same boxes and am having the same problem with my top box. It happens even when the rain cover is on my bike. I am beginning to think it is a condensation issue, as it seems to also occur when the nights are cool. (>10C). I don't have an issue with my side cases at all. I am loathe to drill a drain hole, so I use waterproof bags (the zipper ones that bedding comes in work great) and carry a sponge. I have had the Trax boxes for quite a few years, never had an issue with leakage. Eventually I will as they have been used, abused, and pounded out a couple of times. I use clear garbage bags as a precaution. They take up less room than the Trax waterproof liner bags. I know lid rubber gasket for the lid has come loose a couple of times on each case and needs to be re-secured. I'd do like RC suggested and fill with water to see where the water is coming in from then seal with some silicone. Yep, there are several potential leak paths with these things. Things like a loose rivet can be especially insidious. Fill with water and see where it's coming from. Turn it upside-down to check the lid seal. Hang on the bike to put stress on the mounting points. You might need to use RTV, have a cracked seam rewelded, bash a few rivets to tighten them up, enhance the lid seals somehow, or all the above. Good tips here. I hadn't considered putting water in it and rotating to see where water comes OUT. MUCH easier than trying to fill a bathtub and sumberge it. I'll check out these things. Maybe it was condensation. In either case, as I commute regularly with my bikes, a waterproof bag seems a little overkill each time when I want to just place my helmet in the topbox, or drop some groceries or something in the sidecase. I'll check it out and see what comes of it. Thanks folks! 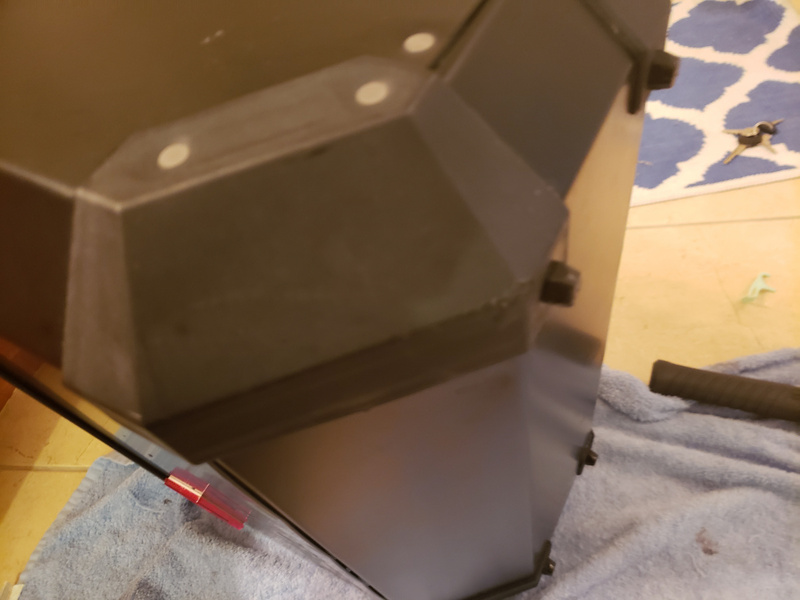 TL/DR - Found the problem spots by putting maybe a gallon or two of water in the cases (in bathtub), and turning case over to all corners to find the offending leaks. Spot the leak, feel gaps with silicone (hammering siding back in place if need be), and let it cure. Then test again to make sure it stuck. All good now! My particular situation - Bike is second-hand, you could see it had been dropped (judging from rashes, just dropped, not lowsided). 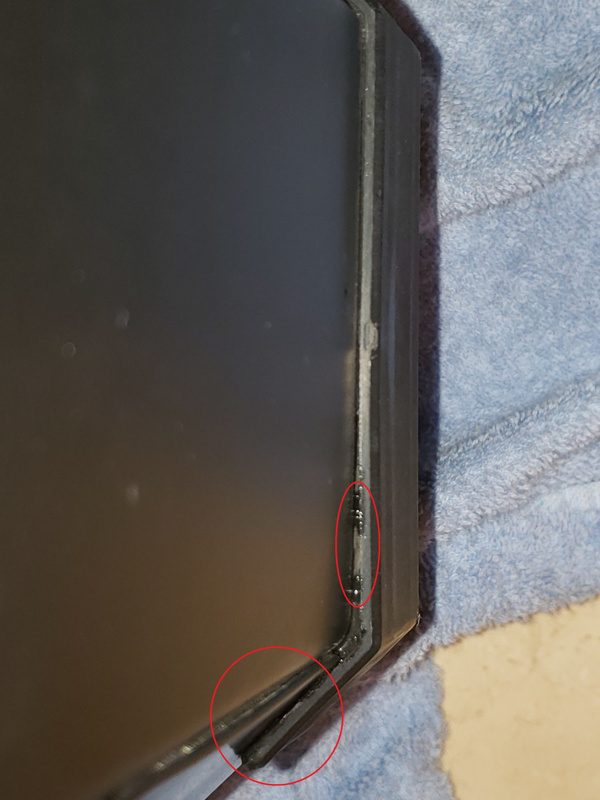 Damage is VERY miniscule (you can see in the pictures of the corner of the boxes). 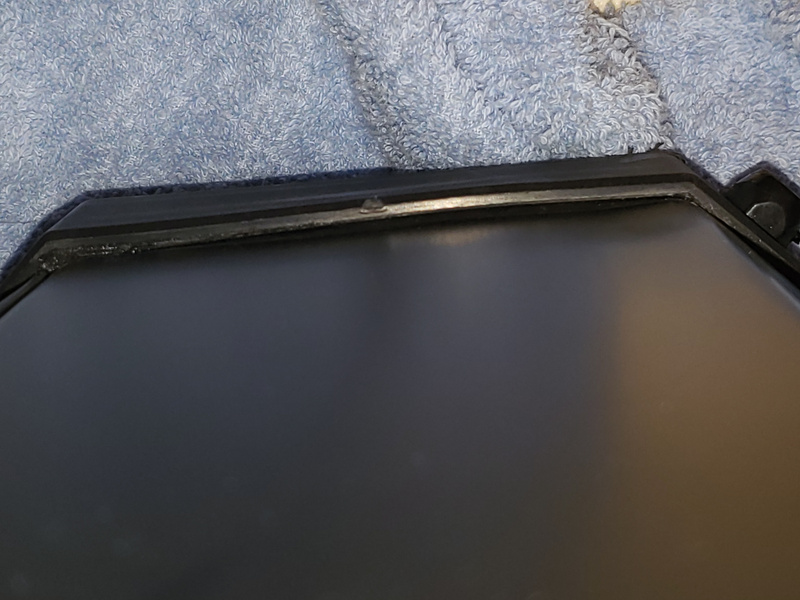 Issue was that in the drop, the aluminum side bowed in, away from the plastic riveted corner, which broke the waterproof seal from the factory. The water getting in was actually dripping down the side of the box, and then seeping in at the bottom corner, not from the top. 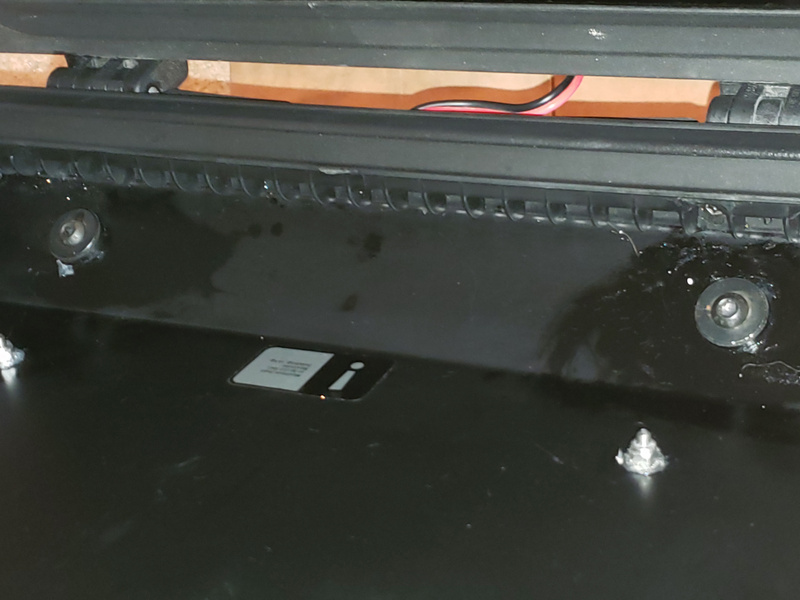 So I water tested all the boxes, found the offending corners, hammered the aluminum siding flat again if it needed it, and filled the gaps with silicone. I also found leaks in the topcase where the backrest was attached, DESPITE the rubber washers, so I used silicone there too! All in all, two days of testing and retesting, and all is waterproof again! Thanks for the tip to fill the box... so simple, and so effective!